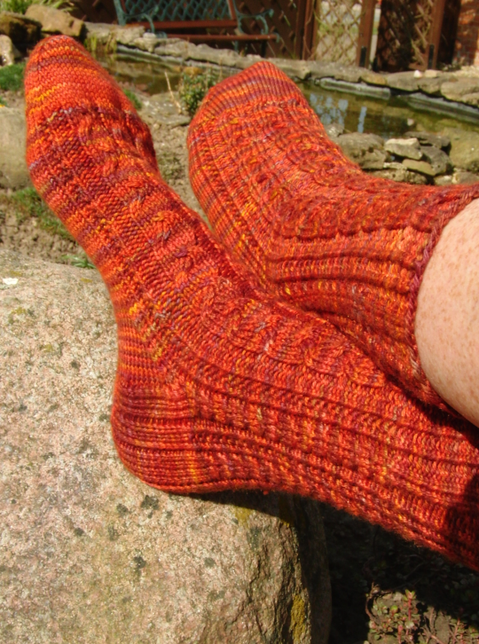 Warm Feet in NZ's Winter - monemades Webseite! Now that the socks have made it to their new home in New Zealand, just in time before winter in the southern hemisphere, I can finally share one of the projects I knit on holidays. You've already seen the beautiful socks Glen made for me in our 'Knit my Yarn' Sock Challenge, and these are the socks I knit for her in return. The yarn Glen sent, SweetGeorgia Yarn Cashluxe Fine, was a dream to work with and after trying them on for the picture I'm sure they'll be a dream to wear too. So soft! I am so happy to hear the socks fit Glen! The pattern is called 'Wallace' and is by one of Glen's favourite designers, Rachel Coopey.